Usually, the hokey world of "official" liquor days is dominated by spirits and cocktails. But here's one that celebrates a specific kind of wine: Grenache. 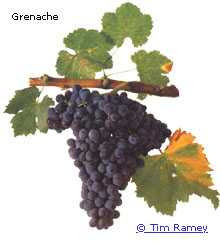 Sept. 24 will be International Grenache Day, a whole day in honor of the world’s most widely planted red grape. The aim of the day "is to create a wave of familiarity and interest so that one day people will walk into their favourite bar or restaurant and ask for a ‘Glass of Grenache’ as they do currently with Pinot Grigio or Merlot." Good luck with that.